Brandy Tabor, CVT, VTS (ECC), is a senior emergency/critical care technician at Animal Emergency & Specialty Center in Parker, Colorado. She is also chair of the Academy of Veterinary Emergency and Critical Care Technicians Credentials Committee, a board moderator with Veterinary Support Personnel Network, and an instructor of several courses at VetMedTeam.com. While pursuing her bachelor’s degree in equine science at Colorado State University, Ms. Tabor worked as an assistant in the critical care unit at the CSU Veterinary Teaching Hospital. There, the talented and knowledgeable nursing staff inspired her to become a veterinary technician specialist in emergency and critical care. This article was originally published in the September/October 2014 “Today’s Technician” column of Today’s Veterinary Practice. Today’s Veterinary Practice is the NAVC’s official, peer-reviewed journal for veterinarians. You can find the full list of “Today’s Technician” articles on the Today’s Veterinary Practice website. Heatstroke is a common problem in pets during the summer months, especially in hot, humid climates. This life-threatening condition can affect dogs of any age, breed, or gender. Heatstroke in dogs is defined as a nonpyrogenic increased body temperature above 104°F (40°C), with a spectrum of systemic signs.1 The ability to rapidly recognize and begin treatment of heatstroke is vital to maximize the chances of saving the animal’s life. Maintenance of normal body temperature is an important aspect of preserving homeostasis and preventing interruption of normal metabolism. The thermoregulatory center, located in the anterior hypothalamus, maintains body temperature within a narrow range, or set point. A pyrogenic hyperthermia, or fever, may be induced by an increase in the set point in response to disease. Differentiating between pyrogenic and nonpyrogenic hyperthermia is important, due to the variation in pathophysiology and treatment of each disease process. A nonpyrogenic hyperthermia, such as heatstroke, is not due to a change in the hypothalamic thermoregulatory set point, which allows us to perform active cooling without the consequences previously mentioned. The body uses several methods to cool itself, which are described in Table 1. Heat-related illness can vary in severity and, in humans, is classified based on that severity. Heatstroke is classified as exertional or nonexertional (classical). Nonexertional heatstroke results from exposure to increased environmental temperature in the absence of adequate means of cooling. This may be seen when a dog is enclosed in a parked car or left in a yard without shade and water. Negative acute-phase proteins decrease by 25% during an acute-phase response.5,6 In most species, albumin is a negative acute-phase protein, and levels may decrease during an acute-phase response due to gastrointestinal (GI) or renal loss or decreased production. Positive acute-phase proteins increase by 25% during an acute-phase response.5,6 In dogs, positive acute-phase proteins include C-reactive protein and serum amyloid A.
C-reactive protein activates the complement system, which promotes phagocytosis, and up- or down-regulates cytokine production and chemotaxis. Fibrinogen: Plays a role in tissue repair. Heatstroke has multiple deleterious effects within the body (Table 3). Direct cytotoxicity occurs at body temperatures ranging from 106.7°F to 107.6°F (41.5°C – 42°C). At these temperatures enzymes and proteins are denatured.1 The severity of these effects depends on both degree of body temperature elevation and duration of time it is elevated. Susceptibility to cytotoxicity is increased, resulting in injury and death of neurons. Disseminated intravascular coagulation may then occur (Figures 1 through 3). Initially, cardiac output, peripheral vasodilation, and central vasoconstriction are increased. Blood is unable to adequately circulate, resulting in electrolyte derangements, acidosis, and production of microthrombi. Increased permeability of GI mucosa can potentially result in translocation of bacteria and bacterial products, such as endotoxin. 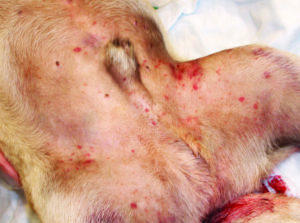 Direct thermal injury and protein denaturation lead to tubular necrosis. Figure 1. 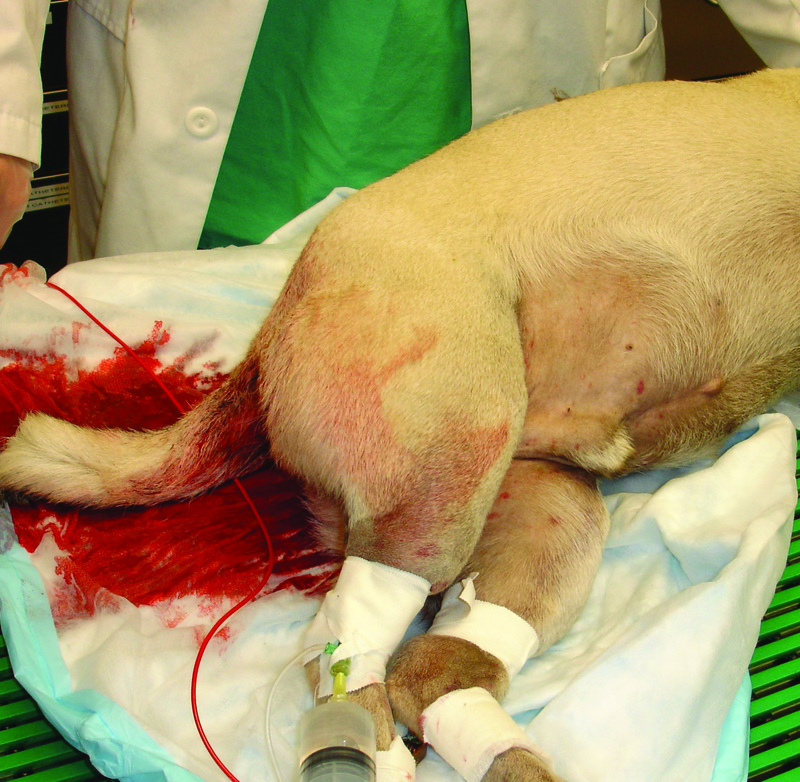 Petechial hemorrhage on (A) the abdominal wall, and (B) the ear pinna of a young pug with disseminated intravascular coagulation caused by heatstroke. Brachycephalic breeds are particularly at risk for heatstroke because of limited ability to thermoregulate as a result of partial upper airway obstruction. Figure 2. Bloody urine in a pug with heatstroke may reflect intravascular hemolysis or hemorrhage into the urinary tract due to coagulopathy. Figure 3. 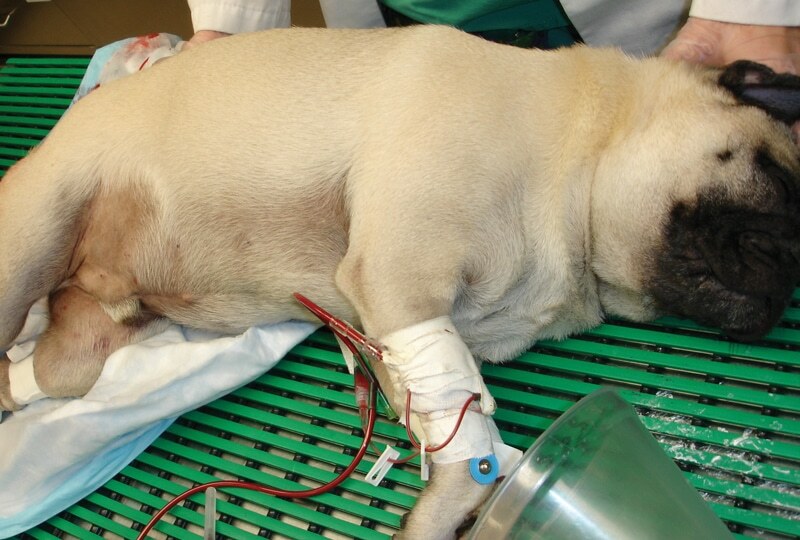 Emergency resuscitation of this comatose pug with disseminated intravascular coagulation due to severe heatstroke included administration of a blood transfusion. History often includes recent exercise or confinement in an area without access to water or shade. The most common clinical signs in one study were collapse, tachypnea, shock, inappropriate mentation, and signs of coagulopathy,10 but may also include tachycardia, hyperemia, and hyperdynamic to nonexistent pulses. Concurrent central nervous system (CNS) signs can range from slight ataxia to seizures or coma. Damage to the GI tract quickly leads to severe diarrhea. The diarrhea is often bloody (hematochezia) when it comes from the lower GI tract, or it may be black (melena) if originating from the upper GI tract. Although hyperthermia is usually present, a patient with heatstroke may present normothermic or hypothermic due to cooling efforts prior to arrival at the hospital, a prolonged travel time to the hospital, or secondary to shock. Coagulation panel, including prothrombin time (PT) and activated partial thromboplastin time (aPTT). Common findings in patients with heatstroke are listed in Table 4. Implementing treatment as soon as possible—even before the patient reaches the hospital—significantly improves the patient’s prognosis. Avoid use of ice as it causes peripheral vasoconstriction, preventing cooling of blood via shunting to the periphery.14 Ice may also damage the skin and make treatment uncomfortable for the patient. Intravenous fluids are considered a cornerstone of heatstroke treatment. Upon arrival, establish IV access in the patient and administer room temperature crystalloids.1 A bolus of crystalloids is beneficial for hypovolemic and hemoconcentrated heatstroke patients. Crystalloids provide cardiovascular support by expanding intravascular volume, and increasing blood flow to the periphery, aiding with the cooling process. Once hospitalized, crystalloids should be continued to provide maintenance fluid therapy as well as replace continuous losses (seen with continued vomiting and diarrhea). If crystalloids do not adequately maintain intravascular volume, consider administering colloids.1 Colloids may also be considered if the patient is hypoalbuminemic.1,13,14 Fresh frozen plasma is recommended if the patient has prolonged PT and/or aPTT. GI tract support. Antiemetics (metoclopramide, dolasetron, maropitant) are beneficial when GI tract damage or CNS abnormalities cause nausea. Administer GI protectants because GI ulceration is likely to occur. Proton pump inhibitors (omeprazole, pantoprazole) are beneficial to prevent or treat gastric ulceration, while famotidine acts as an H2 receptor antagonist and also decreases the production of acid. Sucralfate is given orally and acts as a local protectant that binds to ulcers preventing further damage from acid, pepsin, or bile (Table 5). CNS support. CNS abnormalities are common in heatstroke patients. In some cases, these abnormalities may result from increased intracranial pressure. Additional nursing management of patients with suspected cerebral edema may include elevation of the head and avoidance of compression of the jugular veins. Adapted from Plumb DC. Veterinary Drug Handbook, 4th ed. White Bear Lake, MN: PharmVet Publishing, 2002. Although unlikely to be seen on presentation, multiple organ dysfunction syndrome (MODS) may develop during hospitalization. MODS occurs when 2 or more systems are affected and begin to fail. Because heatstroke affects multiple organ systems, the risk for developing MODS is high, and the patient should be monitored closely during hospitalization. Placement of a urinary catheter and monitoring of urine production is beneficial in patients with renal insufficiency or failure.14 Normal urine output in a dog on IV fluids is at least 1 to 2 mL/kg/hour. A decrease in urine output may be due to renal failure, hypovolemia, or hypotension. If unable to place a urinary catheter, the patient’s urination should be monitored closely. Abnormal neurologic signs that do not resolve once body temperature normalizes. In humans, 20% of heatstroke victims suffer unresolved brain damage and CNS abnormalities, which have been linked to high mortality rates.12 Therefore, return of normal CNS function is considered a positive prognostic indicator for dogs that have suffered heatstroke. Surgically address upper airway obstructions, such as brachycephalic airway disease or laryngeal paralysis, to decrease risk in individual susceptible patients. Johnson SI, McMichael M, White G. Heatstroke in small animal medicine: A clinical practice review. J Vet Emerg Crit Care 2006; 16(2):112-119. Cannon JG. Perspective on fever: The basic science and conventional medicine. Complement Ther Med 2013; 21:S54-S60. Hemmelgarn C, Gannon K. Heatstroke: Thermoregulation, pathophysiology, and predisposing factors. Compend Contin Educ Pract Vet 2012; 35(7):E4. 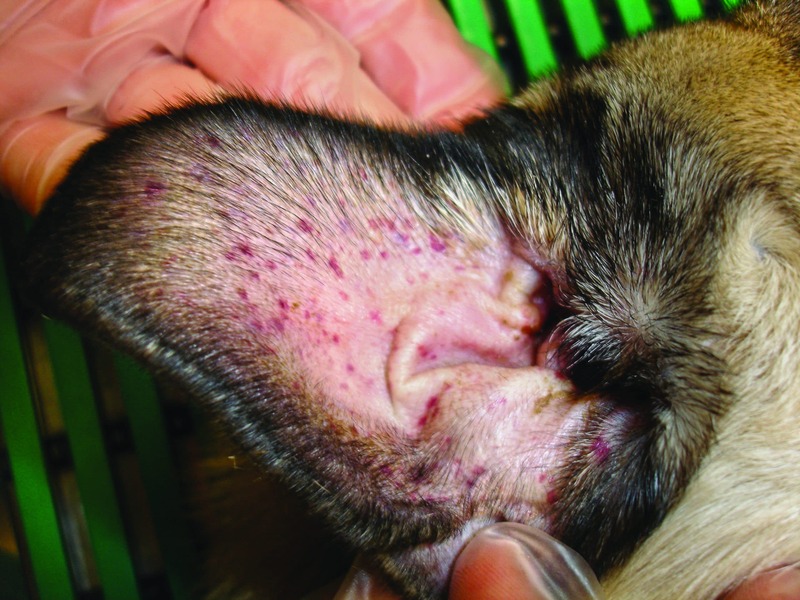 Fluornoy WJ, Hepler D. Heatstroke in dogs: Pathophysiology and predisposing factors. Compend Contin Edu Pract Vet 2003; 25(6):410-418. Gabay C, Kushner I. Acute-phase proteins and other systemic responses to inflammation. NEJM1999; 340(6):448-454. Cray C, Zaias J, Altman NH. Acute phase response in animals: A review. Comp Med 2009; 59(6):517-526. Epstein Y, Roberts WO. The pathophysiology of heat stroke: An integrative view of the final common pathway. Scand J Med Sci Sport 2011; 21(6):742-748. Wu X, Zhang Y, Yin Y, et al. Roles of heat-shock protein 70 in protecting against intestinal mucosal damage. Front Biosci (Landmark Ed) 2013; 18:356-365. Bruchim Y, Loeb E, Saragusty J, Aroch I. Pathological findings in dogs with fatal heatstroke. J Comp Pathol 2009; 140(2-3):97-104. Bruchim Y, Klement E, Saragusty J, et al. Heat stroke in dogs: A retrospective study of 54 cases (1999-2004) and analysis of risk factors for death. J Vet Intern Med 2006; 20(1):38-46. Bouchama A, Knochei JP. Heat Stroke. NEJM 2002; 346(25):1978-1988. Fluornoy W, Wohl JS, MacIntire D. Heatstroke in dogs: Clinical signs, treatment, prognosis, and prevention. Compend Contin Edu Pract Vet 2003; 25(6):422-431. Hemmelgarn C, Gannon K. Heatstroke: Clinical signs, diagnosis, treatment, and prognosis. Compend Contin Educ Pract Vet 2013; 35(7):E3. Hadad E, Rav-Acha M, Heled Y, et al. Heat stroke: A review of cooling methods. Sports Med 2004; 34(8):501-511.